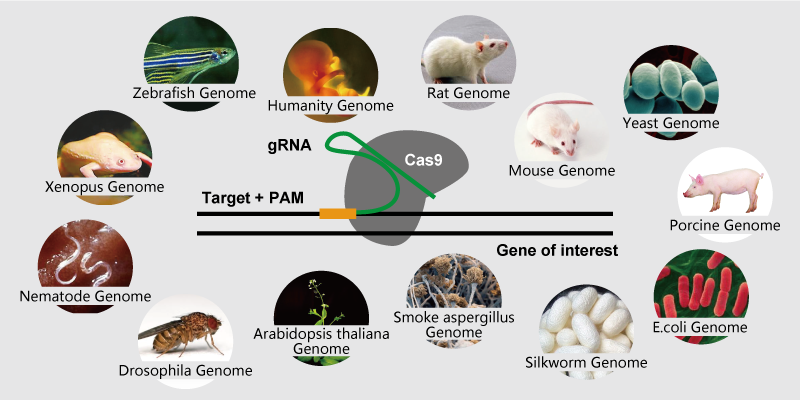 The CRISPR-Cas9 system is a prokaryotic immune system driven by RNA that triggers resistance to foreign genetic elements and provides a form of acquired immunity. sgRNA serves as a guide to recognize and combine target with DNAs, allowing activated Cas9 nuclease to attach, cleave, and modify the PAM downstream target DNA. CRISPR-based genome editing technology has made it easier and faster than ever to alter specific DNA sequence in the genome or to perform genome-wide functional screening tests to identify genes involved in a particular phenotype. CRISPR-Cas9 is considered as the most promising tool in gene modification. The sgRNA design center of Synbio Technologies provides services such as single CRISPR-Cas9 sgRNA plasmid or sgRNA library design, downstream verification, and stable cell line construction. We offer a one-stop solution for CRISPR-Cas9 projects to achieve high genome editing efficiency. Professional Design Center: Providing single sgRNA, multiply sgRNA and sgRNA library design service. Experienced: Well-designed sgRNA sequences with lowest off-target rate; Professional analysis is also provided to ensure the success of each project. Applicable in many species: Database covers sgRNA design for 13 different species; Specific sgRNA design is also available upon request for certain species. Custom Vector Construction: sgRNA can be designed in any vector that customers require.